Monday saw the BBC Oxford Book Afternoon Bookclub with Kat Orman - discussing The Great Gatsby, Chris Bradford's 'Bodyguard: Hostage' and Simon Rae's 'Keras' (Kat liked this book so much that she bought my copy during the show - now that was a first!). Click here to listen to the show and fast forward to 1 hour 10 minutes (the link stays on iPlayer until May 20 - enjoy!). 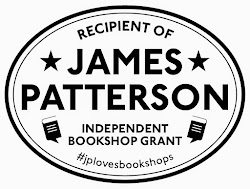 Next was a trip to the Bookseller Industry Awards in London Monday night - we were there as a guest of Barefoot Books (shortlisted for Children's Independent Bookseller of the Year). 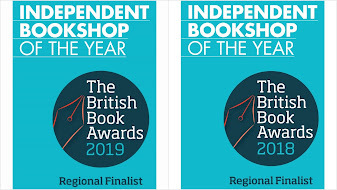 It was an extremely glamorous evening, and huge congratulations to fellow indies Lingham Booksellers (who won indie of the year) and newbie Octavia's Bookshop in Cirencester for children's Indie of the Year. Yesterday Karen, Ellie and Julia transformed the window to celebrate Usborne's 40th birthday. ...and finally, last night we celebrated the launch of a new children's history book of Abingdon: 'Sixty spooky, strange and suprising stories about Abingdon'. Written by Brother Cedric, a 14th century monk who haunts Abingdon library (albeit ghost-written by local author Judy Stubley) we felt very honoured to host the launch party.